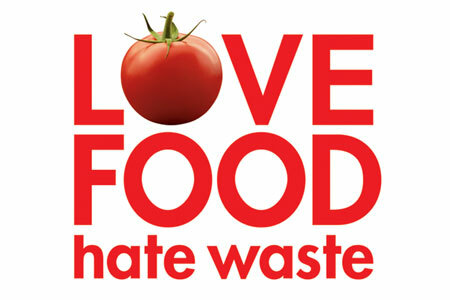 Roughly one quarter of the calories and one third of the mass of the world’s food crops are wasted. This waste happens in each phase of our food’s journey from farm to fork (or trash bin). When combined, though, the world wastes enough calories to feed 1.9 billion more people the diet the World Health Organization says is needed to be healthy and satisfied. The term “food loss” usually refers to a failure of infrastructure and systems in the supply chain that reduces the mass or nutritional value of food, such as lack of refrigeration and storage, logistics, insufficient training, or poor access to markets. “Food waste,” on the other hand, happens mostly because our behavior and conditions in our homes, institutions, restaurants, and grocery stores cause edible food to be discarded or to spoil. In this report though, we use “waste” for simplicity, but we discuss aspects of food loss throughout. Consumers in industrialized economies globally waste nearly as much food as Sub-Saharan Africa’s net food production. Worldwide, we already grow enough food to meet everyone’s needs, but food waste dramatically reduces the food supply that is delivered to people. Reducing food waste in developing countries means a greater supply of food is available to be eaten. If accomplished along with other changes to food availability and accessibility, reducing waste could also mean better food security. The food we directly throw away as consumers is just the beginning of the problem. The majority of the environmental impact of food waste is not from the food rotting in the refrigerator, or spoiling in a field, but from the fact that agriculture needed to happen in the first place to grow the food. Wasted food also means that we waste all of the resources that go into agricultural production, including land, fertilizer, water and associated environmental problems such as greenhouse gas emissions. While we can’t eliminate all waste, making headway could promise twin benefits: adding calories to the global food supply, and lightening agriculture’s impact on the environment. Some level of waste is unavoidable. We don’t eat bones, hulls, or orange peels, for example. About a third of food waste consists of truly inedible food, but the rest could have been eaten. The scope of this report does not include waste from the byproducts of processing. It also doesn’t include food redirected to food banks and ultimately consumed. In addition, it doesn’t factor in waste from overconsumption of food beyond caloric and nutritional needs. A small portion of global food waste leaves the food supply somewhere along the food chain, but can be repurposed for uses like animal feed or bioenergy. However, in this report, human food directed toward other uses is considered waste. In lower-income countries, most food waste happens early on, during crop production and after crops have been harvested. Poor harvesting equipment leaves crops on the field, and poor infrastructure and inefficiencies in supply chain systems lead to post-harvest spoilage. Pests, fungus, disease, and other causes of spoilage often compromise the food during storage and handling. Farmers may have inadequate storage equipment or techniques, and they may wait too long to transport harvested crops to market. This can also be due to inadequate roads and distribution systems. In subsistence farming communities, consumer losses are lower because people don’t have access to as much food as developed world consumers. In the less-developed countries, people also spend a much higher proportion of their incomes on food, making it less likely that they will want to waste food at home. As developing economies urbanize, supply chains become longer and more complex, but also more efficient. The result is often less waste during harvest and post-harvest (as a percentage of overall waste), but as food availability improves, more waste during consumption. Middle and high-income countries tend to have more efficient harvesting machines, more reliable storage facilities, more dependable transportation, and sophisticated packaging. All together, these resources help to minimize waste before food reaches the consumer. 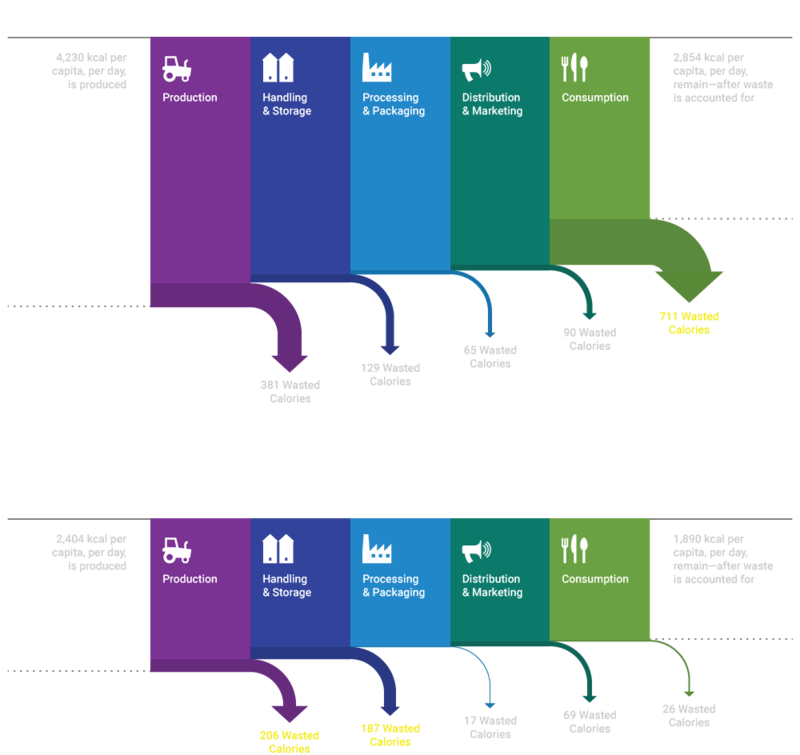 On a caloric basis, production losses in Sub-Saharan Africa (39 percent) and South and Southeast Asia (32 percent) are roughly double the waste in North America, Oceania, and Industrialized Asia combined (17 percent). But this is where the story turns sour. In North America, Oceania, and Europe, more than half of food waste happens during the consumption stage of the food supply chain. Food reaches the market but is thrown out before it is used. If food is past the “use by” or “best before” dates, supermarkets and consumers often mistakenly assume the date labels mean the food is unsafe and throw it out. In fact, these labels are not regulated, and do not relate to food safety but to a manufacturer’s claim of its highest quality. We purchase the food and bring it home, but don’t prepare it before it spoils. We prepare too much, and don’t eat the leftovers. This happens at other points of consumption, too—at restaurants, at catered events, and in schools and hospitals. While overall rates of food waste in developed countries are as high as in developing countries, on a per-capita caloric basis waste is much higher in developed countries. Countries that are the most productive on a per capita basis tend to waste the most. For example, North America & Oceania has the highest per capita food production, and the highest per capita waste (1334 kcal per capita per day). On the other end of the spectrum, South and Southeast Asia has the lowest per capita food production, and lowest amount of waste (404 kcal per capita per day). Since wealthier countries tend to eat diets with more animal products, in many countries the dietary transition also amplifies the environmental cost of food waste. 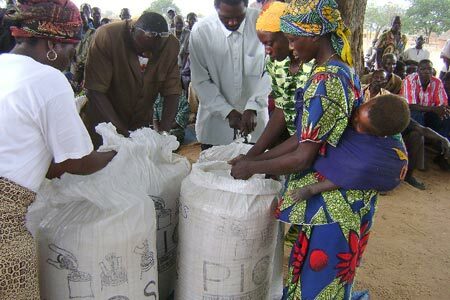 Most wastage in developing countries happens due to food loss during harvest or post-harvest. Direct economic cost: Food waste is a threat to both farmers’ and consumers’ bottom line. In the United States, an average family of four pays between $1,350 and $2,275 per year for food they don’t eat. Water resources: The embodied water from global food waste accounts for roughly 12-15 percent of water consumed globally. This water is mostly used for irrigating crops, but also later in the food supply chain for processing, marketing, and food that goes uneaten. Cropland and fertilizer: Between 20 and 30 percent of global cropland is dedicated to food that is wasted. Similarly, one-fifth of the fertilizer applied globally each year is used to grow wasted food. Greenhouse gas emissions: The greenhouse gas emissions associated with food waste (excluding emissions from land use change) is about 3.3. Gtonnes of CO2 equivalent per year. The FAO notes that, if emissions from global food waste was a country, it would be the third highest emitter, behind the USA and China. The total cropland used to grow food that is never eaten almost equals all cropland in Africa. Fresh fruits and vegetables Because they are so easily bruised and spoiled, fresh fruit and vegetables have very high rates of waste. Asia, Latin America, South and Southeast Asia, and Europe. In the graphic below, the impact of waste amplifies significantly when we consider the true cost of wasting meat—measured here by the embodied feed required to produce the wasted meat. If the crops that livestock animals consume during their lifetimes are included, reducing consumer waste of most of the key commodities noted below in the USA, China, and India alone could save enough calories to feed about 413 million people per year. There’s mounting evidence that setting an attainable target could be a key global strategy in ensuring future food security. One study found that if all regions reduced waste to the level of the best-performing region for each phase of the food supply chain, global waste could be reasonably reduced by half. The FAO concurs with this target, concluding that waste could be reduced from 24 percent to 12 percent. To meet current needs, this means we would need to grow 1,314 trillion kilocalories less than we do now. 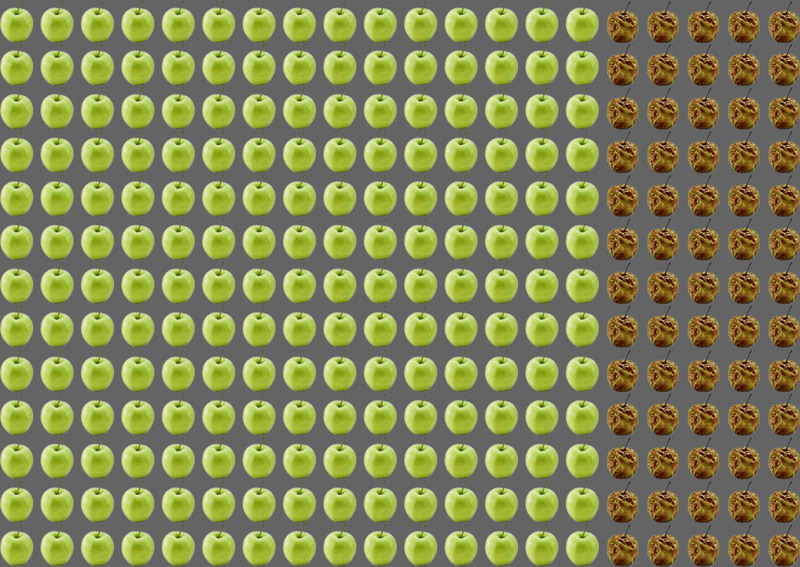 That’s enough calories to feed about 1 billion people, or the projected global population growth between 2015 and 2028. A 50 percent cut is already the European Union’s goal for reducing food wastage by 2025. Halving food waste would also roughly halve its environmental impacts. This could save an area of cropland equivalent to the size of all of Brazil’s cropland (78 Mha), as well as the same amount of fertilizer as used in all of Brazil (12 Mt per year). To some, the phrase “awareness campaign” reeks of feel-good inefficacy. 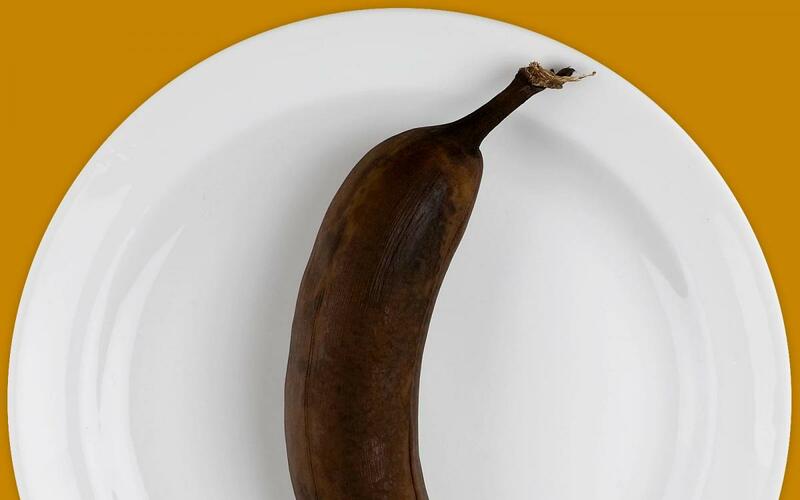 But the UK-based Love Food Hate Waste effort spans sectors, uniting government and charity behind strategies ranging from city communications to cooking classes—a comprehensive drive that cut food waste in the country by 18 percent in just five years. Produce that fails to meet consumers’ demanding aesthetic standards often lands in the trash heap. 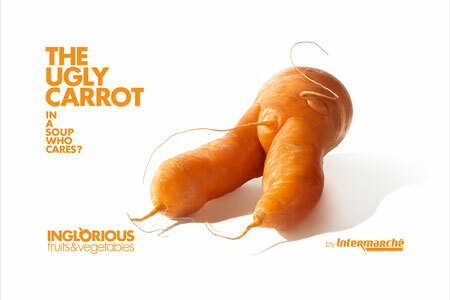 One French supermarket chain responded with an “inglorious fruits and vegetables” campaign, selling imperfect food at a discount and seeing store traffic rise. Supermarkets across Europe are following suit. 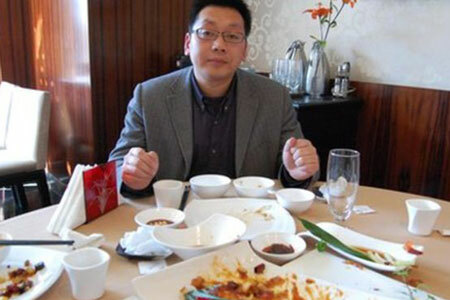 When he learned that the food wasted by college students in his country could feed 10 million people per year, Chinese activist Xu Zhijun began campaigning online for reduced waste. Chinese President Xi Jinping has endorsed the effort. Food waste is one of the most compelling reasons to improve the sustainability of our food system. Food waste lowers overall global food availability, reduces food security, and has an economic cost. It also requires resources and needlessly heightens environmental impacts. Combined with changing our diets, reducing food waste is one of the most effective demand-side solutions available to ensuring a healthy food system. Credits: Barrett Colombo, Peder Engstrom, Graham MacDonald, Alex Reich, Andrew Urevig, Paul West. Design: smashLAB. Bajželj, Bojana, Keith S. Richards, Julian M. Allwood, Pete Smith, John S. Dennis, Elizabeth Curmi, and Christopher A. Gilligan. 2014. “Importance of Food-Demand Management for Climate Mitigation.” Nature Climate Change 4 (10): 924–29. (FAO), Food and Agriculture Organization. 2013. Food Wastage Footprint: Impacts on Natural Resources—Summary Report. FAO Rome, Italy. Fox, Tim, and Ceng Fimeche. 2013. “Global Food: Waste Not, Want Not.” Institute of Mechanical Engineers, London, Jan.
Gunders, Dana. 2012. “Wasted: How America Is Losing up to 40 Percent of Its Food from Farm to Fork to Landfill.” Natural Resources Defense Council Issue Paper. August. This Report Was Made Possible through the Generous Support of The California Endowment. Gustavsson, Jenny, Christel Cederberg, and Ulf Sonesson. 2011. “Global Food Losses and Food Waste: Extent, Causes and Prevention.” Rome. Hall, Kevin D., Juen Guo, Michael Dore, and Carson C. Chow. 2009. “The Progressive Increase of Food Waste in America and Its Environmental Impact.” PloS One 4 (11): e7940. Jalava, M., M. Kummu, M. Porkka, S. Siebert, and O. Varis. 2014. “Diet Change—a Solution to Reduce Water Use?” Environmental Research Letters 9 (7): 074016. doi:10.1088/1748-9326/9/7/074016. Kummu, M., H. de Moel, M. Porkka, S. Siebert, O. Varis, and P. J. Ward. 2012. “Lost Food, Wasted Resources: Global Food Supply Chain Losses and Their Impacts on Freshwater, Cropland, and Fertiliser Use.” Science of The Total Environment 438: 477–89. doi:10.1016/j.scitotenv.2012.08.092. Parfitt, Julian, Mark Barthel, and Sarah Macnaughton. 2010. “Food Waste within Food Supply Chains: Quantification and Potential for Change to 2050.” Philosophical Transactions of the Royal Society of London B: Biological Sciences 365 (1554): 3065–81. doi:10.1098/rstb.2010.0126. Parry, Andrew, Keith James, and Stephen LeRoux. 2015. “Strategies to Achieve Economic and Environmental Gains by Reducing Food Waste.” Waste & Resources Action Program. Reich, Alexander H., and Jonathan A. Foley. 2014. Food Loss and Waste in the US: The Science Behind the Supply Chain. April. West, Paul C., James S. Gerber, Peder M. Engstrom, Nathaniel D. Mueller, Kate A. Brauman, Kimberly M. Carlson, Emily S. Cassidy, Matt Johnston, Graham K. MacDonald, and Deepak K. Ray. 2014. “Leverage Points for Improving Global Food Security and the Environment.” Science 345 (6194): 325–28.